I can't believe I just sat through two hours of complete boredom. 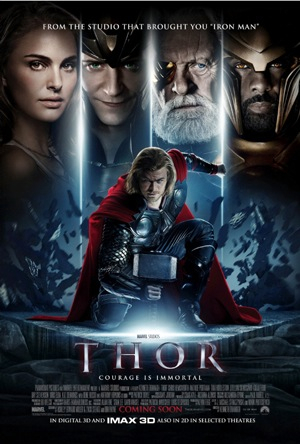 When I first watched the trailer for "Thor" (2011), I actually thought this would be a good movie to watch. You can't blame me for thinking that since the last few big screen adaptations of Marvel Comics have been quite good, like Iron Man. The first little niggle came in the shape of Stan Lee, creator or co-creator of most of Marvel's greatest comic book fame. He made his customary cameo appearance in the form of a hapless character. He drove the pickup truck which failed to pull the hammer out of the ground. Is it me or is it a little egotistical that he sticks himself in every Marvel movie? The opening sequence was a bit odd too. The story of Thor and how it all begins took nearly half of the time allotted for this movie. Yet, I came through the other end feeling a bit let down. The story felt rushed, even though it took so long. Not much of the background came through. I'll say this for the first time - they should have gone on with the story and did a prequel after a few years. I normally can't stand prequels... Except in the form of "Star Trek" (2009). Then there's the character of Natalie Portman. She recently won an Oscar for Best Actress. Yet, in this movie, she acted like a little girl with a huge crush running after some blond guy with a toned six pack. She looked pathetic, as m sure her character was written to be. But it didn't fit. None of the characters had enough time for said characters to build and become interesting for the audience. I've already forgotten them, and it's not more than and hour since the post credits ended with another cameo by Samuel L. Jackson as Nick Fury. As Roger Ebert said in his review of this poor excuse of a movie, the CGI didn't do much to give an impression of time and space, they all just looked like effects. It reminded me of that Greek Myth themed movie from not so long ago called "Clash of the Titans" (2010) with Sam Worthington. The effects of Mount Olympus nearly drove me out of the cinema because it was done so poorly. In the end, not a great continuation for Marvel and their intellectual properties. Let's hope "The Avengers" will be a bit better!